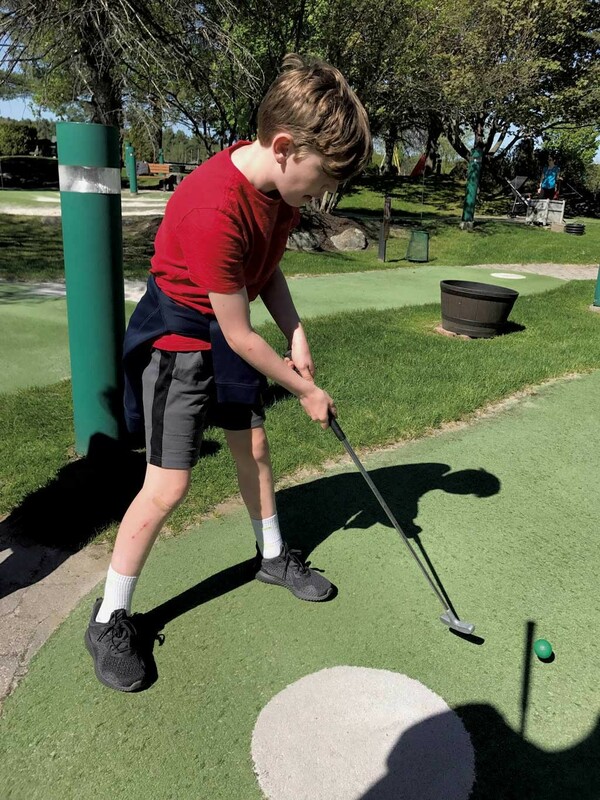 Destination Recreation: Stowe Golf Park | Destination Recreation | Kids VT - small people, big ideas! It's about the least-adorned mini-golf course you can imagine — not a windmill, tunnel, waterfall or T. rex in sight. 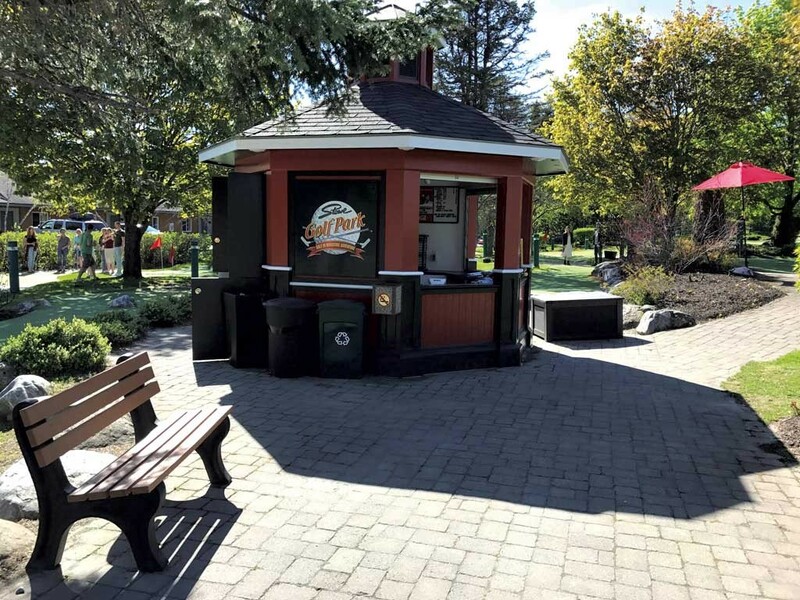 Miniature golf might just be the ultimate afternoon outing with kids. It's challenging, yet accessible. It's relatively quick, but not over in a blink. 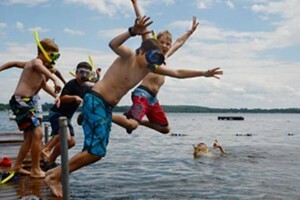 It's an outdoor activity, but you don't need bug spray. And even when putts are drifting into sand traps, it's still good, clean fun. 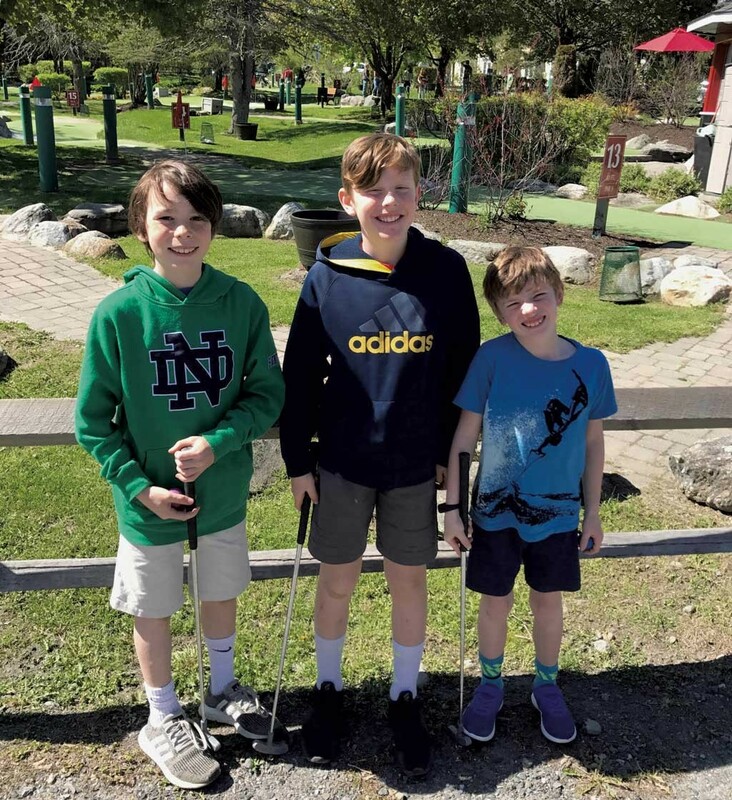 My family's adventure to Stowe Golf Park — located on Mountain Road, in front of the Sun & Ski Inn and Suites — took place on a recent Friday afternoon. I picked up my kids, 10-year-old Felix and 7-year-old Leo, plus their 10-year-old friend Miles, an hour early from school in Burlington (shhh! ), then headed to Stowe. The drive flew by as the kids chatted about Magic cards, the new Avengers movie and school happenings. We paid our admission, then chose our golf balls from a dizzying array of colors. We agreed on a youngest-to-oldest putting order, which meant that, after writing our names on the scorecard with a tiny golf pencil, Leo was up first. His ball sailed right off the green, into the rough. I granted him an early mulligan and set up the ball for him again. His second shot went into the rough, too. When it came to offering advice or critique, I stuck with a less-is-more mentality, which turned out to be a good decision. After all, mini-golf is all about having fun, and who wants to hear a boring lecture from dad about putting technique? My sons aren't very competitive when it's just the two of them, but the competition level was definitely higher with a friend in the mix. I was proud of the boys for keeping their emotions under control, though, especially Felix, who stayed calm when he couldn't get his shots to go straight and his score kept rising. The course itself is compact and the holes snake around one another with impressive efficiency. It's about the least-adorned mini-golf course you can imagine — not a windmill, tunnel, waterfall or T. rex in sight. But it's challenging, which kept the kids engaged through 18 holes. The golf park's website touts it as a place "that strives to simulate real golf," and I agree with that assessment. The greens are full of slopes, and you often find yourself putting uphill or downhill and around a bend. Rather than being discouraging, though, the challenging terrain gave us something to laugh about. And with temps in the mid-70s and the sun on our backs, being outside, joking around and trying to snag that elusive hole-in-one felt like the perfect reward after a long week. The proximity of the course to the traffic on Mountain Road does make the experience a little noisy. The drink cooler and ice cream freezer hadn't yet been stocked for the summer season, but we persevered through this minor blip. We stopped on our way home at the Ben & Jerry's Factory on Route 100 in Waterbury, where we enjoyed a cone in the late-afternoon sun. Stowe Golf Park is open daily from 10 a.m.-9:30 p.m. from May to October. Admission is $10 for adults and children 13 and up, $8 for children 6-12, and free for children 5 and under. Find more information at sunandskiinn.com.